We are a full-service digital agency specializing in consulting, developing, and expanding businesses of any size. Every project we take on is a collaborative effort. We take your ideas to hear and work hard on how we can serve you best. This is where we establish how to let your story and your brand shine. Every facet of a project is created and constructed by a team of expert designers and developers. Before launching, we make sure each website is responsive and offers great user experience. We unveil the project to the world and give your brand support with final tweaks and testing. Search engine optimization is also deployed for better traction and success in the digital realm. 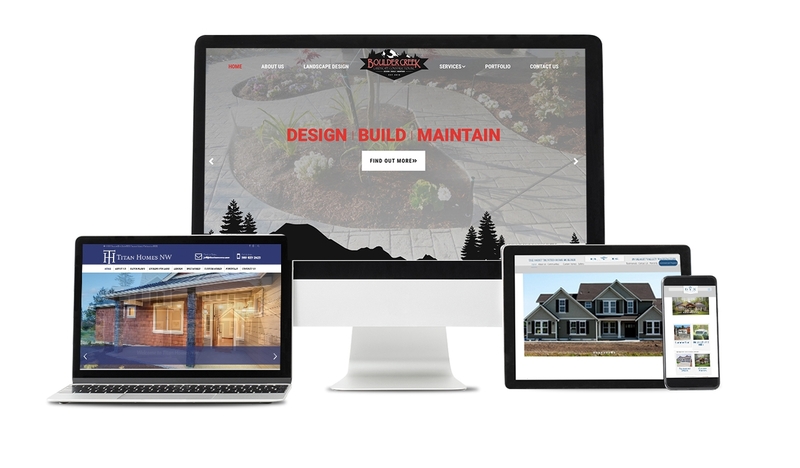 With our ultimate goal to display the quality of work that our clients do, we make sure that every website we design and develop for our clients in the general construction industry are professionally constructed, too. They showcase clean and solid style and a display of projects that are easy to navigate. These companies are some of the trusted builders in the region and our aim is to build a reputation as strong as theirs in the realm of web marketing for general construction. 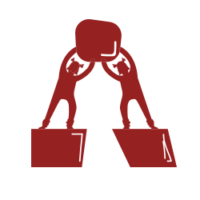 We also offer them support in both their digital and traditional marketing efforts. Titan Homes NW is a very reputable custom home builder on Camano Island, WA. NSC worked with Titan on the design and build of their custom website as well as their overall marketing and advertising plan including both digital and traditional. The goal is always to reflect Titan’s brand digitally with excellence and professionalism. Titan Home’s ownership allows NSC complete oversight over marketing direction. BYK Construction is one of NSC’s first clients. BYK has built a reputation as being Skagit Valley’s most trusted home builder over the last decade and earning their services was a major milestone for NSC. NSC shaped a custom website for BYK that consistently gets revised. NSC builds all of BYK’s Plat and Commercial websites as well. NSC works in conjunction with BYK ownership as well as their marketing team on all efforts short and long term regarding their digital brand. BCLC is a high end design and build landscaper in Skagit County, WA. NSC worked with BCLC ownership to create a new brand identity as well as a custom website that is both aesthetic and very user informative for potential clients. NSC continues to support BCLC with all web and digital marketing related needs. Nothing compares to the joy with working with non-profit companies that do noble work in our community. 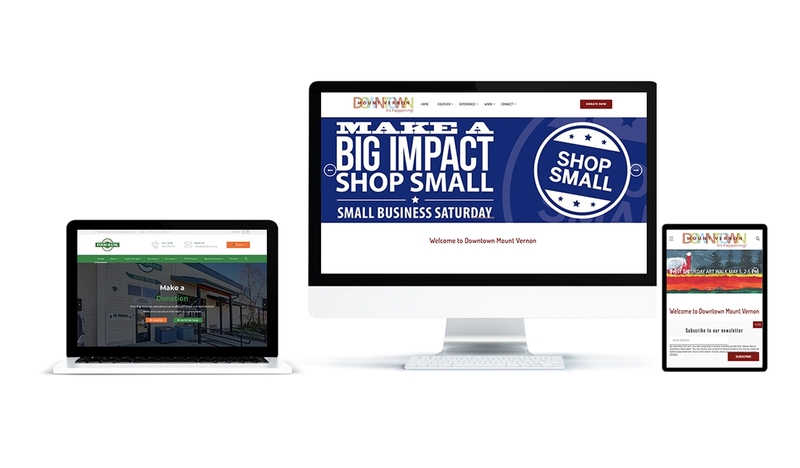 Norse Sound Creative has helped with the digital branding and web development for Mount Vernon Downtown Association and Stanwood Camano Food Bank. Both do exemplary work in our community and in neighboring regions. With this in mind, we made sure that the websites we designed and developed for them were beautifully functional and dynamic. They showcase the organizations’ causes. They are also easy to navigate, especially for those who would love to take advantage of their services, events, and many great offers. The MVDA is the face of Downtown Mount Vernon, it was an honor to be able to work with their team to create a new digital brand for the association. The MVDA is an integral part in supporting downtown business and our community in general. NSC crafted not only a very beautiful viewing website but one that actually portrays the downtown as it should and supports the businesses and events in the Mount Vernon community. 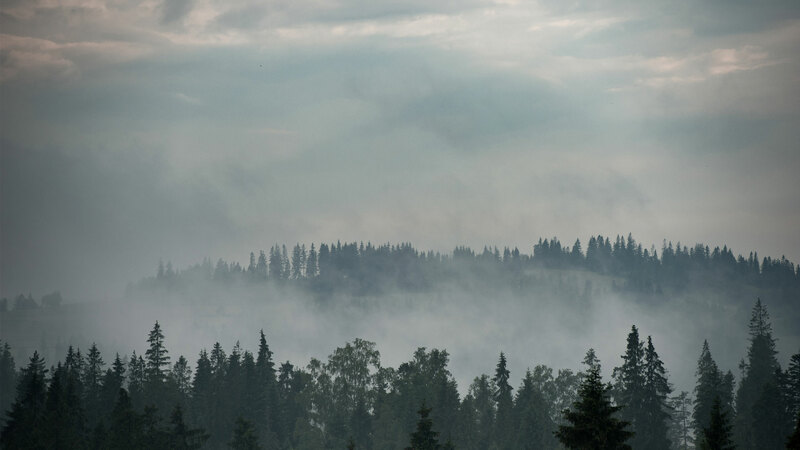 The SCFB is an amazing nonprofit supporting the Stanwood and Camano Island communities. It was a great honor to be able to walk through those doors and meet the management team to start the process of re-inventing their online presence. NSC produced a new custom website that is not only modern but very dynamic. 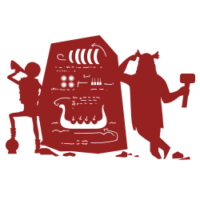 The community and supporters are able to access all the programs they need, sign up for volunteering, services, and everything else the SCFB offers. Wondering how you can provide better service for your customers? At Norse Sound Creative, we design and develop digital marketing campaigns that will help you reach this goal. 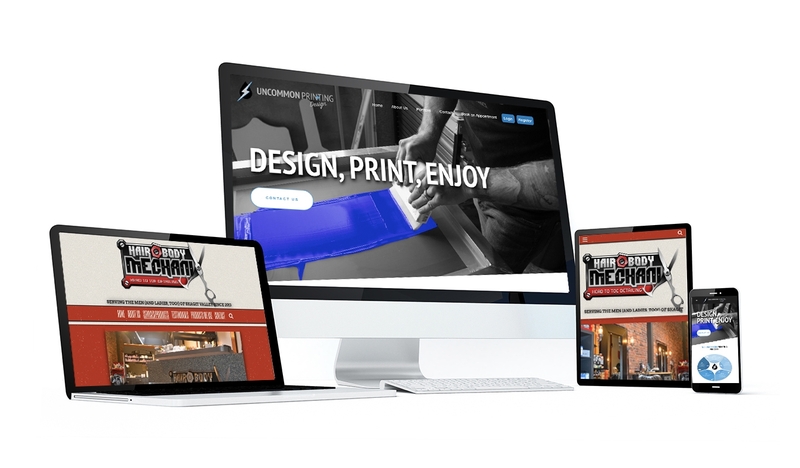 Some of our best work for service-oriented businesses are showcased in the websites we created for Uncommon Printing and Hair and Body Mechanix. In order to better serve their market, we created their websites equipped with a few handy tools, such as booking and ordering tools. Uncommon Printing is a small business that does graphic design as well as custom screen printing and embroidery. 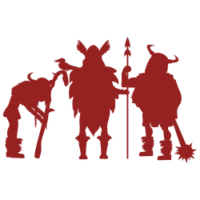 They are a fellow combat veteran owned company and needed a website that served not only as a very artistic and clean information portal but also added some business efficiency tools as well. NSC not only created a very appealing and easy to maneuver website but added two additional efficiency tools. The first being an integrated booking tool to allow for potential customers to easily schedule and book appointments alleviating time from email chains and phone calls. Second, a custom user portal that allows clients to create and submit for graphic design, screen print and embroidery orders. All orders are tracked, approved and updated via this portal so there is seamless communication between the client and the Uncommon Printing. Hair and Body Mechanix is a male oriented barber shop in downtown Mount Vernon, WA. They have a very niche and unique brand identity thus creating a website to match was paramount. With the emphasis on masculine, industrial and steam punch; NSC developed a very simple, single page website that meets their brand identity and allows for easy booking. 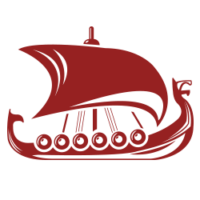 Norse Sound Creative supports businesses, large and small. And the best way we do this is by providing them with digital marketing support of top quality. We offer them beautifully designed and powerfully developed websites that speak well of their brand and story. We also make sure to answer their needs when it comes to reaching a wider market. And we do this by integrating a secure and powerful e-commerce platform for better online shopping experience. 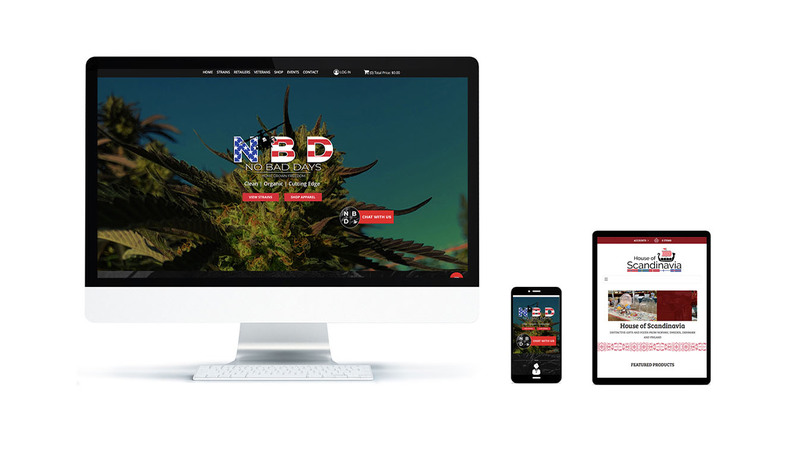 NBD is a licensed i502 cannabis producer and grower in Washington State. NSC worked with Uncommon Printing and Design to create a branding identity as well as a custom website that emphasized who they were as a ranch but also what they produce. This website offers interactive abilities to find retailers as well as full online store for all their apparel and gear. House of Scandinavia is a touch of Scandinavia located in the Black Hills of South Dakota. NSC has roots in Rapid City, SD thus working with clients in this region is special. This is a very clean, responsive website with full e-commerce capability of all the items the shop carries in their brick and mortar store. “Great company! They are always quick to respond to questions, and did a great job on my website SEO issues and helped clear up the Facebook ad campaign troubles I was having.